Raised garden beds have been used for centuries and with good reason - they're not only better for all the vegetables that you intend to grow but they're also easier on your back - built at an appropriate level raised beds can help reduce the aches and pains produced by kneeling or bending over a vegetable patch. They can be built using wood, landscaping ties, decorative paving slabs, or stone - with or without mortar (use your imagination for other materials). They should be no wider than 120cm(4ft) so your vegetable plants situated in the middle of the bed can be reached from both sides. Raised garden beds, apart from being easy on the back, are also very flexible to use. After reading about the topic of permaculture whereby, after (in my case) the raised vegetable bed is prepared with organic material, the vegetable plants grow and are not only harvested but allowed to seed themselves into the bed. I decided to transform (Nov 2011) two of my raised beds and start to experiment with this very natural form of growing vegetables. Confession time... kudos to the more observant amongst you - it's perpetual spinach and not chard - it's an age thing! 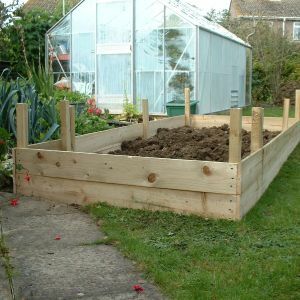 Constructing raised garden beds for vegetable growing more than 3M(10ft) in length will require additional stakes in the middle of the two long sides. This is to keep them from bowing out under the weight of the soil should the sides be made of flimsier material. I personally would build them no more than 3M(10ft) long maximum, then you won't need to walk long distances to get to the other side of a particular area you're working on neither. They can be made to a depth of your choice but between 15-20cm(6-12") is ideal - mine are 20cm(12") deep. Building raised beds are easy and they can also be purchased ready-made. There are a variety quality modular beds available in kit form. Raised garden beds are the perfect answer if your topsoil is thin or full of stones - they are especially useful where space is limited in your vegetable garden as the spacings between plants can be less. These type of beds make it much easier to introduce a rich and balanced growing environment. 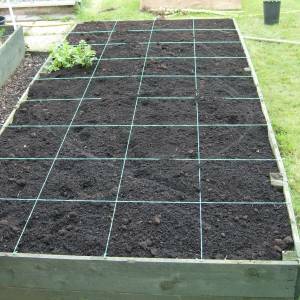 Do this by filling the raised beds with the soil of your choice and adding plenty of well rotted manure or compost, then maintaining and adding to this over time. Soil conditions and types can be controlled more efficiently in a raised garden bed and can be varied easily from bed to bed. Importantly, soil in raised beds does not get compacted because it is not walked on - soil needs water and air to function, compaction robs it of both. Therefore soils that aren't compacted have a greater ability to hold plant-available-water, are less cloddy, allow for greater vegetable root growth and give higher plant yields. Soil compaction can reduce harvest by up to 50 percent - so compaction is serious. Organic matter like composted manure or your own garden compost can be increased in larger quantities without getting bogged down. And as I mentioned earlier, soil in raised garden beds warms up faster in spring because it drains more efficiently than soil at ground level - thus enabling earlier planting of spring vegetables. For example - my raised bed in the photo above had just been topped with well rotted manure compost ready for the new growing season (this photo was taken in early March 2008). All I did was clear the top of vegetable debris then fork over the top a little and cover with the compost. I'll plant straight into this bed and let the worms take the strain.